I am finding hard time explaining what this game is about but I guess that you have guessed it already. I will start by saying the this is the most fun and well presented free flash game that I have played for a long time. The game has very simple, but very addictive gameplay. The unnamed hero of our game has made every man's dream to fly true, using his green gas farts. Yeap! You can lift in the air but you cannot stay there very long. 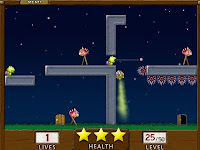 The game has 50 levels that vary in difficulty and you will try to fly your way out of them avoiding monsters, hazards and other colorful stuff at the same time. This gem has a very nice physics engine(if one could say that) that makes to gameplay fluid and enjoyable. Be sure to give it a try. Turn on your speakers to the full and make you neighbors wonder as to what is that sound! Have fun in the process! !